In the first several years of production minor design changes were made - the head of Liberty was modified slightly after 1839, the diameter was decreased in 1840, and lettering and dates were enlarged in 1842 and '43. 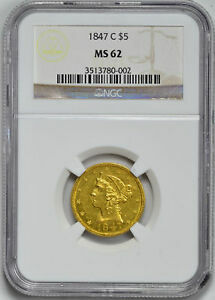 For the date and mintmark collector these minor design alterations provide variety; although - primarily due to engraver James Longacre's ineptitude as a die sinker - there are a considerable number of mis-punched dates and overdates within the series that also provide numismatic interest. 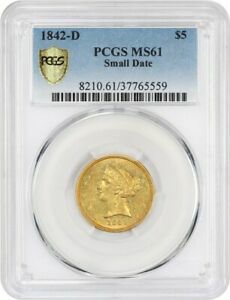 But the true rarities in this series are the low mintage, low availability issues, especially the branch mint issues from Dahlonega and Charlotte, such as the 1842-D Large Date, the 1842-C Small Date, and the 1861-C. There are no standout rarities among the New Orleans issues except, of course, for the legendary 1841-O, a coin that is unknown in any collection even though mint records indicate 50 pieces were struck - presumably all were melted after coining. 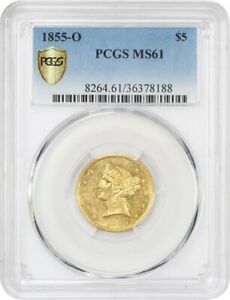 The rarest regular production No Motto half eagle comes from the San Francisco mint - the 1854-S. Only 268 half eagles were struck in this first year the San Francisco mint was in operation, and today only three pieces are known. 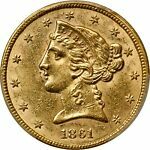 The most commonly encountered half eagles from this period are the ones struck in Philadelphia, with AU and mint state coins often available. The scarcest Philadelphia mint half eagles are those struck during the Civil War, when mintages were low and hoarding widespread. Unlike many other nineteenth century series, No Motto half eagles are still collected today by date and mintmark. However, most collections contain only EF and AU coins at best - in many cases higher grade examples are either not available or are extremely expensive. Another popular method of collecting this series is to specialize in a particular mint. Several complete collections of Charlotte and Dahlonega half eagles have been formed over the years, this being especially popular with collectors living in the South. 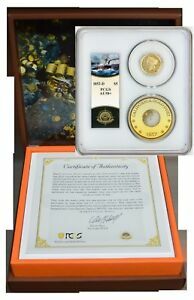 However, far fewer Southern gold collectors have attempted to complete a set of coins from New Orleans, even though EF and AU pieces are more often available from this mint than from Charlotte or Dahlonega. Type collectors can approach the No Motto series by either attempting to acquire one coin from each of the five mints that issued them, or by obtaining one example (usually from Philadelphia) to represent the entire 28 year type. Proofs were struck only in the Philadelphia mint, and all are very rare with yearly mintages after 1858 ranging from 25 to 80 pieces. Grading well struck examples of No Motto fives is a rather straightforward process: look for rubbed spots on the highest portions of the design elements - the hair curls and above the eye of Liberty on the obverse and on the eagle's wings on the reverse. However, incompletely struck coins from this period are the rule, not the exception, and one should expect softness of strike on the hair curls of Liberty as well as the eagle's left (facing) leg on all branch mint coins and some of the Philadelphia issues. Counterfeits are occasionally seen in the series but are generally not a problem. 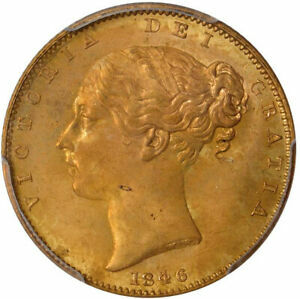 Certain branch mint issues, especially those from the mid-1850s, may show full mint sharpness but dull surfaces. These "seawater Uncs." were allegedly salvaged off a sunken Confederate transport ship in the early 1970s. American Numismatic Association, Official A.N.A. Grading Standards for United States Coins, Western Publishing Co., Racine, Wis., 1977. Bowers, Q. David, U.S. Coin Designs, An Action Guide for the Collector and Investor, Bowers and Merena Galleries, Wolfeboro, N.H., 1986. Vermeule, Cornelius, Numismatic Art in America, The Belknap Press of Harvard University Press, Cambridge, Mass., 1971.